Saluting the courage and invaluable service of the Army on the occasion of the 69th Army Day, Prime Minister Narendra Modi on Sunday said he is proud of his soldiers who are willing to sacrifice everything for the nation. Greetings to all soldiers, veterans and their families on Army Day, "We salute the courage and invaluable service of the Indian Army," Prime Minister tweeted this morning. Greetings to all soldiers, veterans & their families on Army Day. We salute the courage & invaluable service of the Indian Army. Applauding the Indian Army for its courage and valour, the Prime Minister said it has always protected the sovereignty of India. “Indian Army always leads from the front, be it in protecting the sovereignty of our nation or helping citizens during natural disasters,” he tweeted. "Indian Army always leads from the front, be it in protecting the sovereignty of our nation or helping citizens during natural disasters. We remember with great pride all the sacrifices made by our Army. They put their lives at risk so that 125 crore Indians live peacefully," PM Narendra Modi said in a series of tweets. Indian Army always leads from the front, be it in protecting the sovereignty of our nation or helping citizens during natural disasters. We remember with great pride all the sacrifices made by our Army. They put their lives at risk so that 125 crore Indians live peacefully. 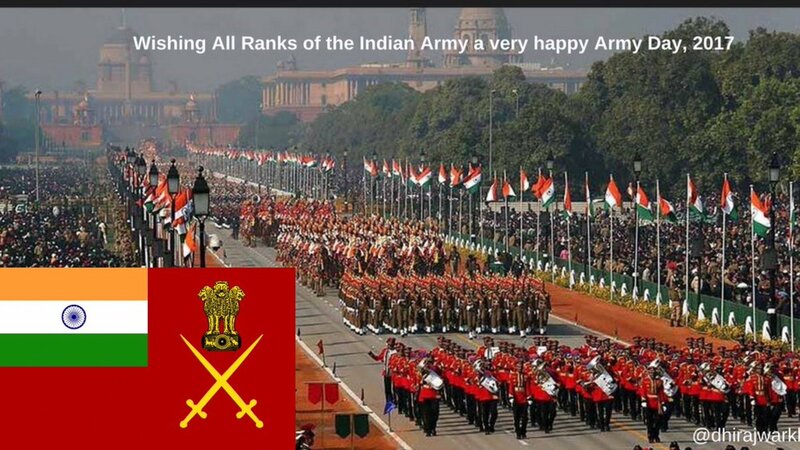 Army Day is celebrated on January 15 every year, in recognition of Lieutenant General K. M. Cariappa’s taking over as the first Commander-in-Chief of the Indian Army from General Sir Francis Butcher, the last British Commander-in-Chief of India, on 15 January 1949.